Sunset brings the promise of fine dining and a raucous nightlife, which doesn’t really get going until well after midnight Picture courtesy of Shutterstock.com. 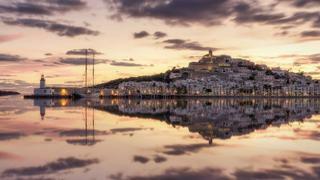 Ibiza has outgrown its hippy past and become a chic destination with beautiful protected harbours. Its UNESCO-protected Old Town has narrow, cobbled streets to explore Picture courtesy of Shutterstock.com. 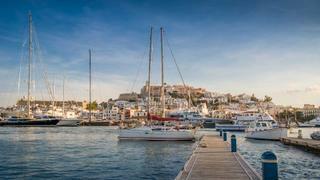 Yachts moored in a marina in Ibiza's Old Town (or Dalt Vila as the locals know it)Picture courtesy of Shutterstock.com. 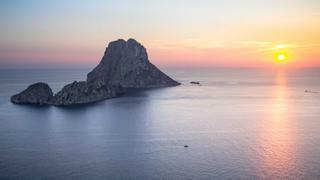 Said to be one of the most magnetic places on Earth, Es Vedrà, rising 400m out of the ocean, is the best place to watch the sun set Picture courtesy of Shutterstock.com. Ibiza originated as a hang-out for hippies in the 1960s before becoming a party hub Picture courtesy of Shutterstock.com. "Near-transparent waters have earned Formentera the moniker “the Spanish Bahamas” Picture courtesy of Shutterstock.com. 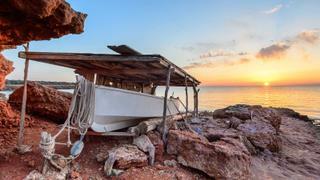 Sunset at Cala Saona with a typical Mediterranean fishing boat called a "Llaut" moored on the rocks Picture courtesy of Shutterstock.com. 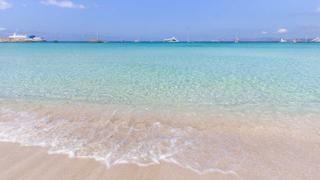 With its untamed beaches, Formentera has an enchanting wildness to it Picture courtesy of Shutterstock.com. The islands of Ibiza and Formentera are only three nautical miles apart as the crow flies but make no mistake, these Spanish siblings have distinctive personalities all of their own. Ibiza is the big sister in size – the island is nearly seven times larger than Formentera – and maturity, having outgrown her purely hippy ways and evolved into an effortlessly chic destination. The island is famous for what happens after sunset, whether that be sand-between-your-toes parties at stylish beach clubs or glammed-up dancing to starry DJs at notorious nightclubs. Kid sister Formentera is the wild child. No matter the age of the residents or visitors, a youthful spirit pervades all. Heels are traded for bare feet, designer duds for dreadlocks and disco balls for dancing under the full moon. Beach clubs are tucked behind sand dunes and the beaches are mostly untamed. There is still plenty of style, it is just of a different variety – creative, understated and impossibly cool. I start my island-hopping experience on board the compact 26 metre Lex at Marina Ibiza, where the quay is lined with designer boutiques and buzzing bars. Set across the bay from Ibiza’s Old Town, this luxe marina is perfectly poised to take in views of the city, especially spectacular when the sunset paints it orange. At the end of the quay is Club Lio, a coveted spot to enjoy the view with a seafood dinner and cabaret show. Lio later transforms into a nightclub – and fortunately it’s only a short hobble in high heels back to the yacht. The next morning it’s an easy cruise to a number of lovely beaches and harbours, to recover or to continue the party. We drop anchor at Cala Jondal, a rocky shore home to the Blue Marlin beach club, which hosts rollicking Sunday parties. Superyachts line up in the long bay and the music carries over the water. 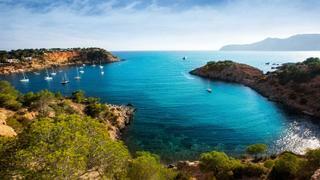 The entire southern coast of Ibiza is dotted with lovely little spots to drop anchor. Porroig is a pretty bay, framed by gently sloping hills, where we play with water toys. Around the corner lies Es Cubells, a quiet beach crowned by a clifftop village that seems lost in time and passed over by Ibiza’s hectic summer season crowd. 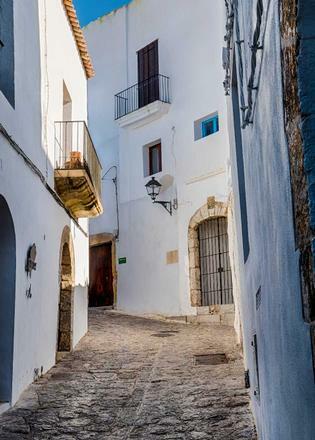 A road leads from the beach up the delightfully un-touristy village, which has a rural feeling, and makes an ideal outing with its whitewashed church, cafés for a cold cerveza and dramatic views. Just on from here is the fabled Es Vedrà. Rising out of the water to 400 metres, this tiny but towering rocky island is said to be the most magnetic point on Earth, after the North Pole and Bermuda Triangle. “The best place to watch the sunset in Ibiza is from a yacht off Es Vedrà – they say it’s a magical place and it certainly has the most magical sunset views,” says Lex’s charter manager and Ibiza local Judith Estrella, of Charter & Dreams. As darkness falls, I wander the narrow cobbled streets of Ibiza’s historic and UNESCO-protected Old Town (or Dalt Vila as the locals know it). Ibiza is replete with international fine-dining fare from Nobu to Cipriani. We opt for the eclectically decorated private VIP room of La Dispensa. It’s ideal for when you tire of tapas – it serves up Mediterranean fare with an Italian focus (don’t miss their creative interpretation of shared plates, such as calamari with refreshing citrus dip). Everything here happens on Spanish time – lunch is at 3pm, dinner sometimes not until 10pm or 11pm. As such, nightlife doesn’t really get going until well after midnight, so it’s the brave among us that carry on to Pacha to stay up late with the kids. The crowd goes wild as costumed, head-dressed dancers twirl in cages and confetti falls from the sky. It’s easy to see why this club has been going strong on the island since the 1970s. The islands are not complete opposites, of course. They both afford beautiful protected harbours, fabulous dining and epic beach bars – all served up with a relaxed attitude. While landlubbers might feel the pressure to choose one, those travelling by yacht can have both, their proximity making it easy to cruise between the two. The water brightens shade by shade as the yacht nears Formentera. As if flipping through a book of paint swatches it changes from cerulean to teal to turquoise, until finally settling on a hue so pale that the golden sand below is fully revealed. We anchor off Formentera’s Cala Saona beach, on the western end of the island, to enjoy breakfast al fresco while taking in the view of the cove framed by sepia rock walls. The cliff faces are steep but not high, the entire island is devoid of hills and the elevation in never more than 22 metres. No high-rise buildings are allowed to be built and disrupt Formentera’s humble panorama. She is purposefully low-profile and entirely laid-back. The near transparent waters, which have earned Formentera the moniker “the Spanish Bahamas” make this protected anchorage an ideal spot to play with the water toys. I let the thrust of a Seabob take me on a ride beneath the waterline, feeling a thrill as I dare to go faster. Beautiful as this spot is, there are more secluded anchorages for those in the know. 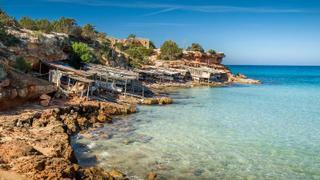 “Right past Cala Saona is a secret spot – there is a small cave where you swim inside and snorkel. It doesn’t have an official name but the captain of Lex knows where it is,” says Estrella. Back on board Lex, it’s not yet noon – but, hey, as the Jimmy Buffett song says, “it’s five o’clock somewhere”. As if on cue, “Mojito Man” pulls up on his well-branded jet ski. Though most superyachts will have a decent bar, there is something entirely novel about getting the “perfect mojito” handmade on board by an expert. Mojito Man stays busy from dawn until dusk, beckoned from yacht to yacht. He brandishes a bushel of fresh mint, blending the most refreshing strawberry mojito. Don’t mistake Formentera’s casual, quieter nature for abstinence. This island simply revels in its own way. The weekend of my visit, it’s the Formentera Jazz Festival. This isn’t the sort of soft jazz found in lifts, but a melange of live music, DJs, documentary viewings and beachside jam sessions. Of course, the DJ set isn’t until 2am. The party is taking place in the open town square, which is full of party-makers despite the late hour. The wardrobe is completely different from an Ibizan club – no heels, no sequins, no disco fever, but everyone attending looks glamorous in their hippy togs. 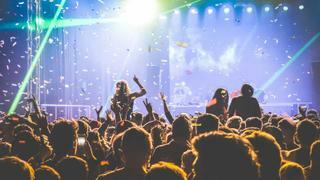 The music flows over the crowd, lifting everyone into a feverish sway, hands foisted into the air, feet stomping, a fresh breeze cooling us down. There is something contagious about the energy of both these islands – they possess the special talent of taking you into their worlds completely. On each you can’t help but slip into the mode of utter relaxation and be energised. Just feel grateful that with a superyacht there is no need to choose just one of these beautiful señoritas.